THE RAW JOURNEY INTO ONE OF THE WORLD'S MOST EXCITING CHALLENGES — RIDING THE WORLD'S BIGGEST WAVE It's a narrative that will scare viewers as much as it will exhilarate. The Big Wave Project is a masterful, award-winning documentary on the art of big wave riding from veteran Australian surf filmmaker Tim Bonython. For five years, Tim followed a tight-knit crew of the world’s best big wave surfers as they each attempted a personal goal – to ride the world’s biggest wave. 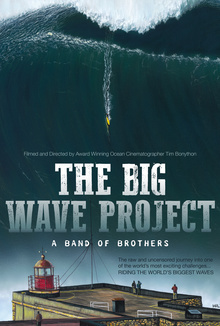 Tim is allowed into the inner sanction of this ‘band of brothers’ as they vividly, and humbly, describe their motivations and fears, and display death-defying feats at the prime big wave locations around the world. As Tim followed the core crew - featured surfers include Jamie Mitchell, Aaron Gold, Mark Healey, Ryan Hipwood, Grant ‘Twiggy’ Baker and Billy Kemper - he realised they worked as a team and all had each other’s back. And Tim is there with his cameras when they are taken to the edge. To capture these breaks in their almost supernatural magnificence, for Tim it’s a labour of love pouring over weather maps as the ‘perfect storms’ manifest and then pinpointing where he needs to be in the world. The gigantic wave images by themselves are incredible, let alone seeing humans pit themselves against the immense power and majesty of the ocean.